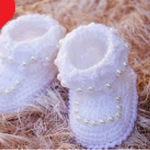 Crochet baby sneakers always look very cute and lovely. Today you have a chance to make fast and very comfortable shoes and keep your baby’s tiny feet warm and stylish. This crochet video tutorial is perfect for a new or expectant mum to try. They would make the best baby shower gift, too. You can choose and combine your favorite color of yarn tastily. Pink for a baby girl and blue for a baby boy. The video instruction is well-explained and it includes all the necessary information about used stitches, materials needed and sizes. 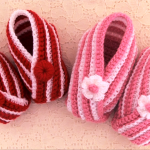 We hope you will enjoy making beautiful baby booties and crochet these homemade shoes for your little one.